Tonight in Hilo, Hawaii, the music of hula can be heard. Carried on the evening breeze, melodic voices raised in chant and song, the percussive rhythms of shark skinned drums and hollowed out gourds, the vibrating strings of ukulele and guitars. This week marks the 53rd Annual Merrie Monarch Festival with a week-long celebration that includes parades, arts and crafts, exhibits and fairs, and of course hula, performed in traditional and modern styles. While every day unfolds pathways for creative journeys, events like this can offer inspiration at every turn and from so many different sources such as the melody of a song, the words of a chant, the strong and graceful movements of a dancer, or the sweet fragrance of blossoms and ferns woven into a lei. Honoring our ancestors and our elders, being thankful for the traditions handed down while being firmly in the present and looking forward to the future, this is definitely a time for celebration and inspiration. The rains announced their arrival by softly tapping on the metal awnings over the windows, like a tentative start to a song, one note at a time. Our mountains had dressed for the occasion with gray clouds looking like misty chiffon draped across their rocky shoulders. We have a saying in the islands, “When the Heavens weep, the Earth lives.” Imagination lives too. With these cooler gray filled days, the melody of rain song and watching as the ocean breezes blow sheets of rain into undulating shapes that dance across the yard, my imagination begins its own dance with ideas. One idea comes from the sense of place, here, in the islands, where nature’s creative journey is constant, punctuated by storm warnings, lava flows, and the occasional Tsunami alert. 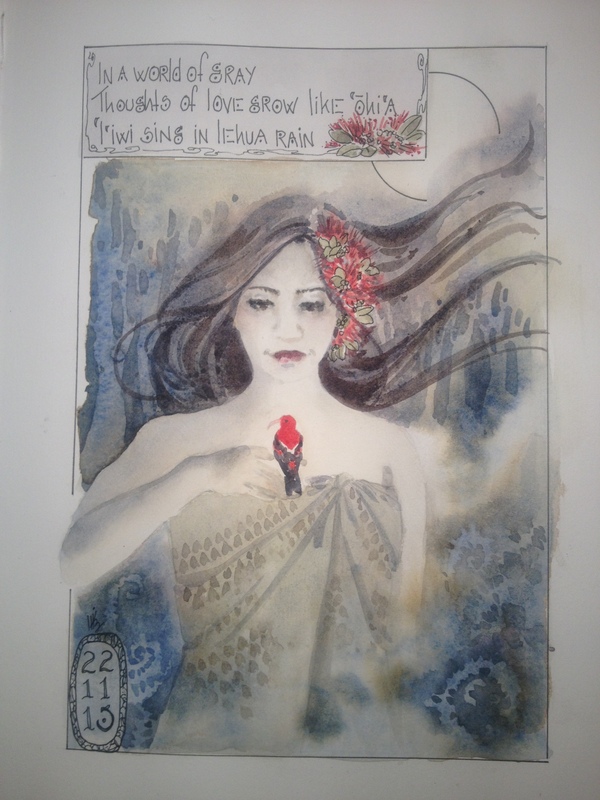 I begin my own creative journey exploring the idea of place, with watercolor, but after a few brush strokes it becomes apparent that the air is full of moisture, causing the paper to dry slowly, almost reluctantly. This calls for a plan B, (there should always be one), bring in acrylics. While waiting for paint to dry between the applications of watercolor layers, I sort through carved linoleum tiles to be used later with the acrylics. Having a theme, or a story, (every painting has a story even if it is only in my head), helps me choose patterns and determine whether I need to carve any new tiles. 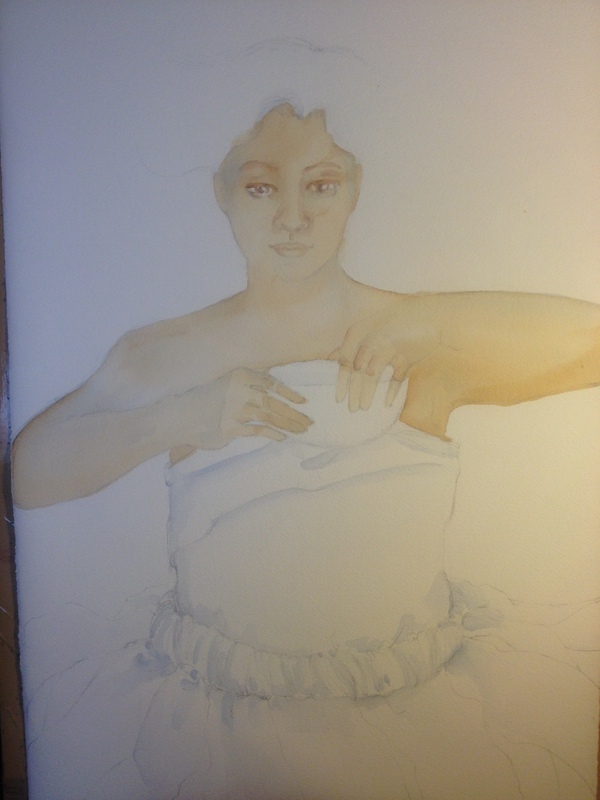 When the watercolor portion has completely dried, my next step is to apply a layer of matte medium. 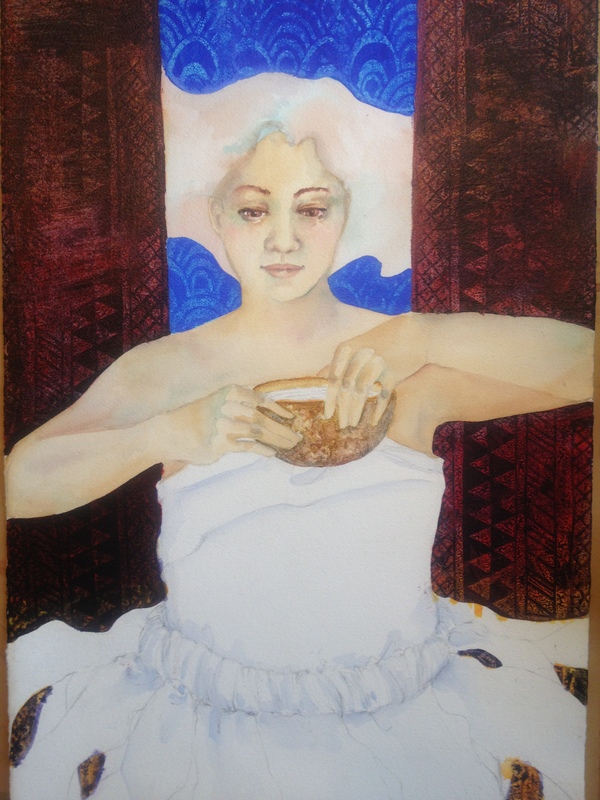 This is the most nerve wracking part as I have to be careful not to disturb or lift the transparent watercolor beneath. 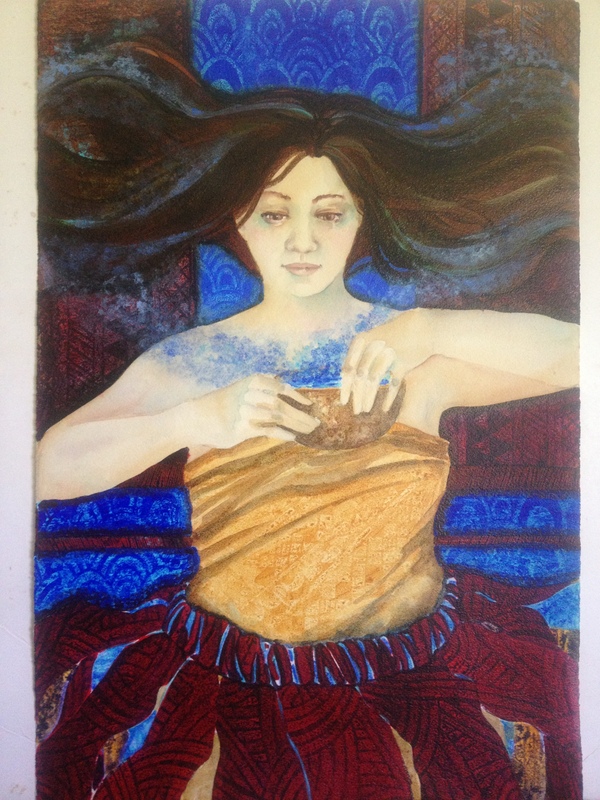 After a few deep breaths and keeping my fingers crossed, the painting is set aside over-night to dry. With the morning comes a new melody. The rains have introduced sporadic percussive rhythms, charged with energy, heavier and faster with a few pauses as though between musical sets. My painting has dried so I put away my watercolor brushes and reach for the acrylics. First, a stroke of acrylic color, next a flurry of activity involving scraping, lifting, spritzing of alcohol, more paint, more lifting, (this time with a linoleum tile leaving a design impression in its wake), and maybe some added scrubbing and scratching with an old plastic hair curler. Working in small sections because the paint dries faster and is permanent, this process, this dance, is repeated over and over. Like the rain, there is a sporadic rhythm with a few pauses to let the paint dry, to take a step back and see where this journey is heading. Eventually I come to that point where I need to take a longer step back, so off I go to make myself a cup of tea and enjoy the music of a rainy day. By the time I return to the painting with a fresh eye and make a few finishing adjustments, the night has gathered and the rain has faded away. Tomorrow will begin a new painting, continuing the creative journey where ideas are like rain puddles waiting to be splashed in, tonight the brushes are stilled, and the only sounds left are the measured drips of water off the leaves and a cricket singing its lullaby into the darkness. Morning arrived gray, low clouds hung so heavy with moisture it felt like sitting in a bamboo steamer, minus the tasty dumplings. Thank goodness our trade winds linger, a little shy at times, but always welcomed with grateful sighs of relief. Last night the rain, envoys from a storm to our south, paid us a visit. Our white plumeria tree must have played host, so many of its blossoms now carpet the ground at its base like abandoned party favors from the late night revelers. Our summer seems to be winding down in its own subtle way, so it was a pleasant surprise to find a bag of these late bloomers, a gift from a friend’s yard, hanging on my kitchen door. 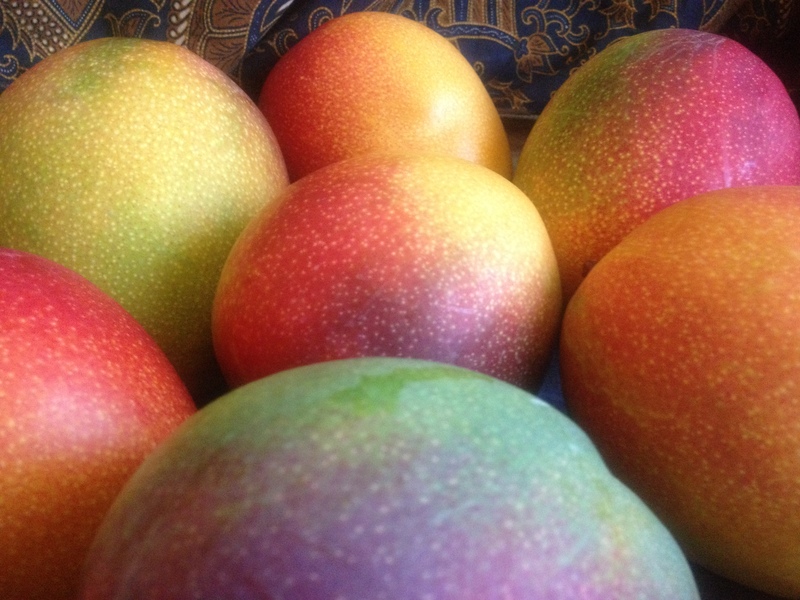 Mangoes are the sweetness of summer sunshine wrapped in rainbow hues of blended colors. I carefully pull each rounded fruit from the bag, taking in their scent and turning them gently round and round in my hands, admiring the way the colors dance and blend. 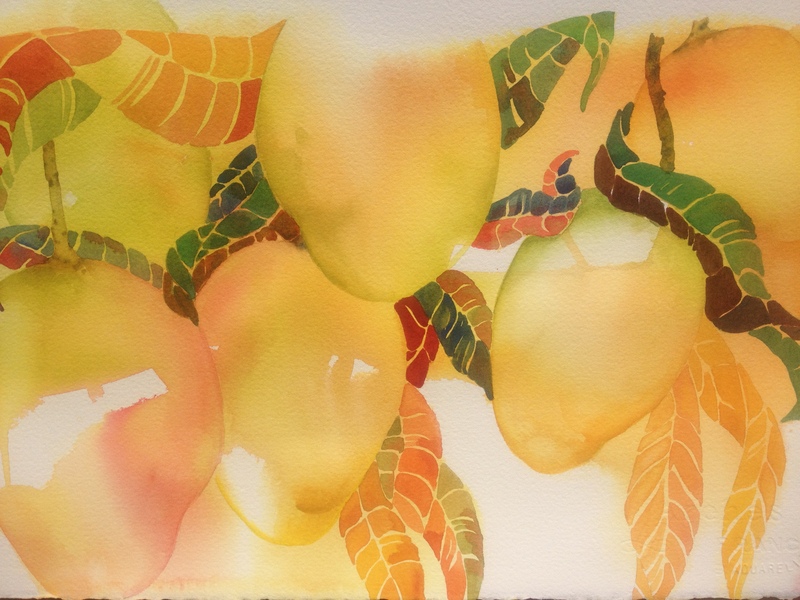 The sight of a ripening mango always sings to me of watercolors and it is a challenge not to drop everything, load up the brush, and start painting immediately. I want to memorize the way the colors mingle so subtly from cool greens to vibrant yellow. 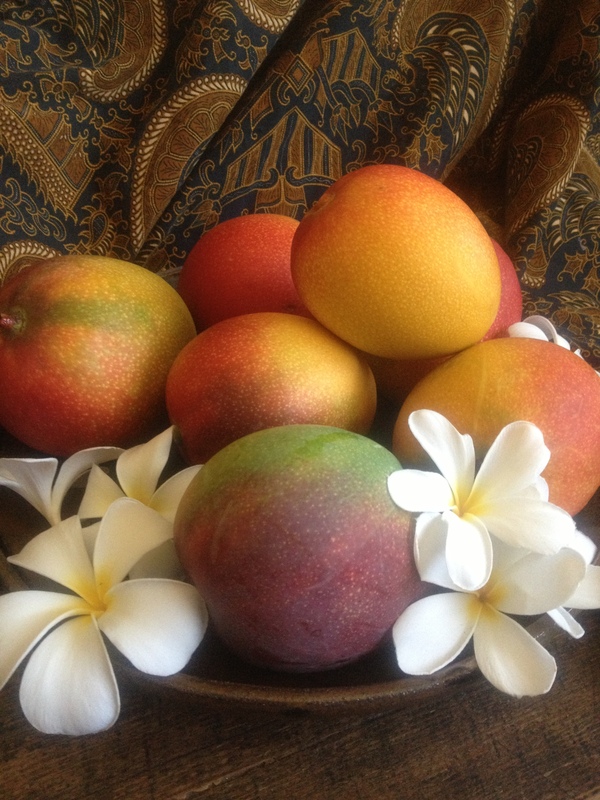 But these beauties are ripe and smell good enough to eat on the spot. a couple of loose sketches, and then back to the kitchen. As I peel and slice my way through memories of summers past, I cannot help but stare for a moment at my hands, now covered with mango juice…what is that color? Gamboge? Maybe a mix of Orange Lake and Hansa Yellow or even Aureolin? I sift through the discarded peels … Is that a hint of Quinacridone Gold next to Rose Lake? And what a lovely purple, maybe a mix of Ultramarine Blue and Permanent Magenta or even Alizarin Crimson? Alright, this is becoming distracting, time to paint. My creative journeys are not always planned and unless there is some sort of deadline involved there is always room to indulge in my penchant for meandering. 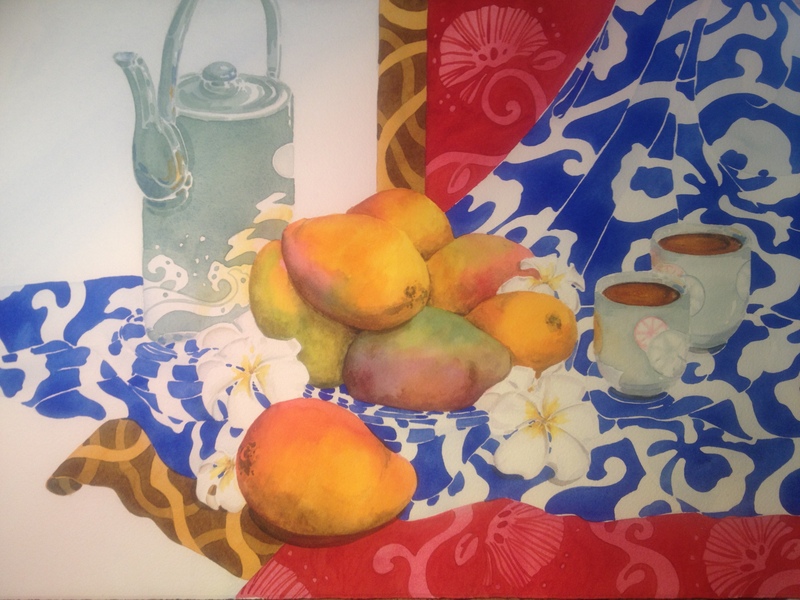 Case in point, I had been continuing my explorations of waterfalls and simple still-lifes with collage, but now with the arrival of freshly picked inspiration I am excited to wander off the paper trail, maybe explore different styles while playing in pools of color. I will probably linger here for a bit and enjoy the remains of summer, at least until I feel the urge to meander once again. It is summer in the islands and the air is weighted with humidity while the trade winds are barely a whisper on the skin. 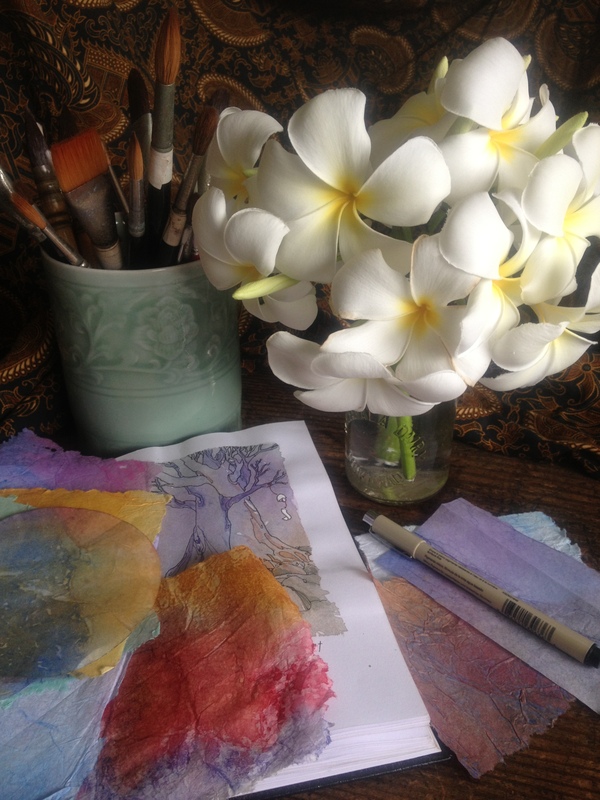 So for the next week or two, watercolor and collage will be my mode of transportation for the creative journey. With the air being fairly still, I can leave my papers out and not worry about having a paper chase every time a breeze wanders through the opened windows. On the other hand, with this sticky weather, I have to be careful not to brush up against a stack of torn paper bits or I might become a walking piñata. The fact is I love paper. Always have. From store bought papers to found bits and scraps of plain, printed, textured, and or tinted ephemera that we come across in life’s journey. 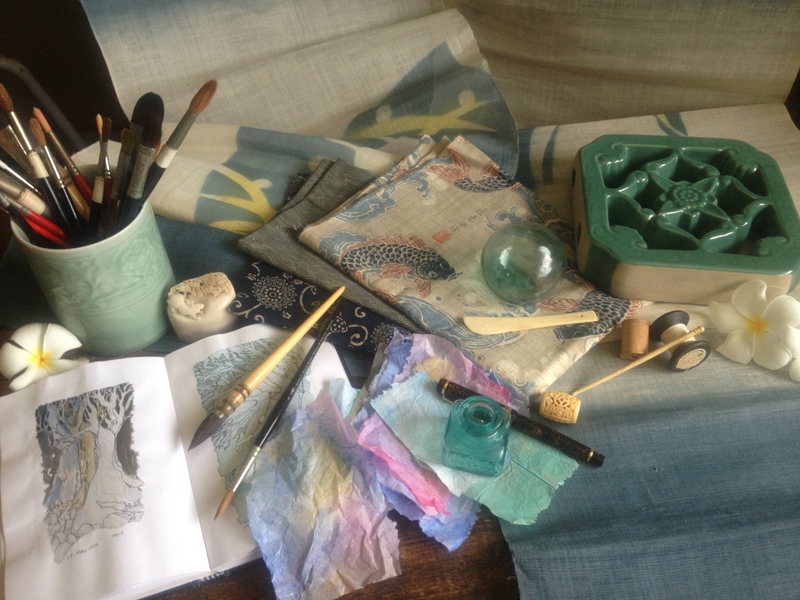 Whether a delicately textured rice paper, or a sheet of elegant Chiyogami paper, even the pretty little postage stamp on yesterday’s mail, all are like little treasures, and with collage, most of these will wind up being torn, crumpled, painted and glued to make more little treasures. Over the years, the paper I get the most use from are those that I can tint or ‘dye’ with watercolors. 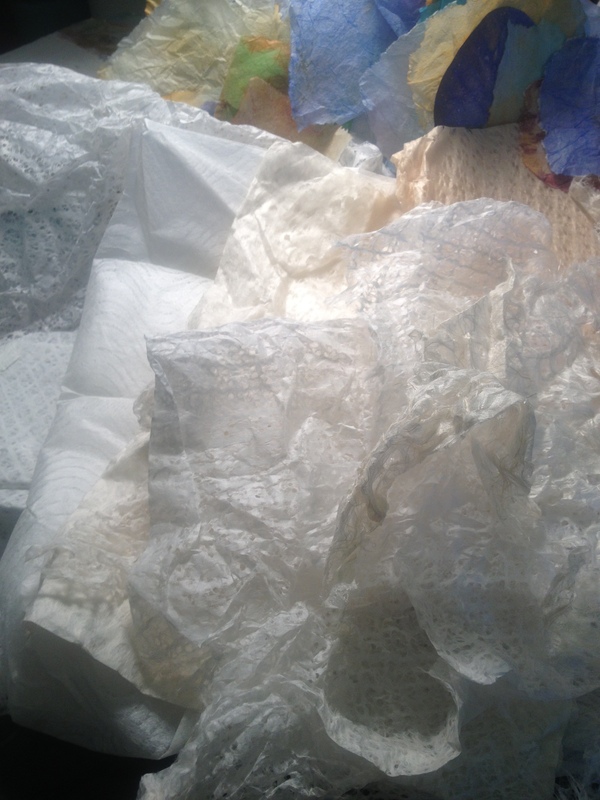 Most often these are ‘found’ papers, particularly plain tissue paper or other light weight papers used for stuffing or wrapping commercial purchases. 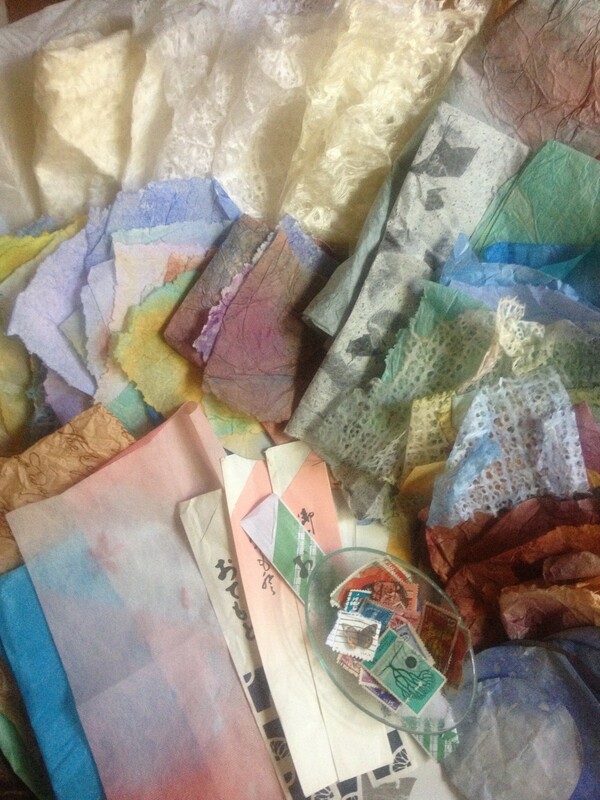 My process of dyeing the papers is varied, but all are fun and carefree. Unless I am after a particular color scheme, it is a go with the flow kind of thing which is great and therapeutic in helping to shake off the stresses of the day. During these sessions I just lay the papers out on a backing board, sometimes in a single layer and other times overlapping up to 3 layers depending on the thickness of the paper. 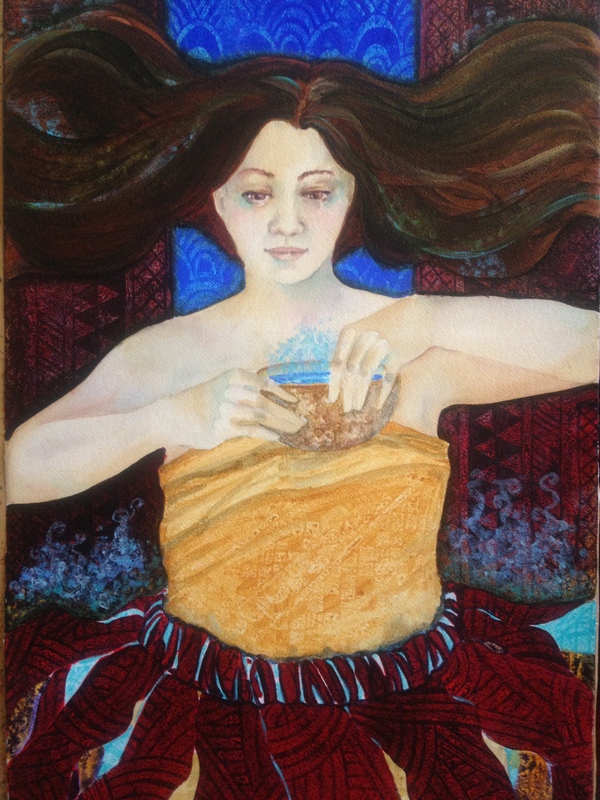 It all becomes a mad experiment on color mingling and intensity with no worries about making a mistake. Periodically I will place the papers on a sheet of 140# cold press Arches watercolor paper and approach it as I would an under-painting. I will do several at a time and it is always exciting peeling off the dried paper and seeing what lies beneath. Examining the remaining imprint, often a textured looking under-painting, frees the imagination to run loose and come up with painting ideas. I also use this method with my sketchbook, tearing smaller sized papers and using random colors on various pages. Later when I am doing actual daily sketches, coming across one of these pages can not only inspire a drawing, but perks up the visual senses with their subtle pops of color. Keeping a few plain papers on hand also helps when I want to clean out color wells to make room for fresher paint or to make use of the remaining puddles of paint in my pallet’s mixing area. 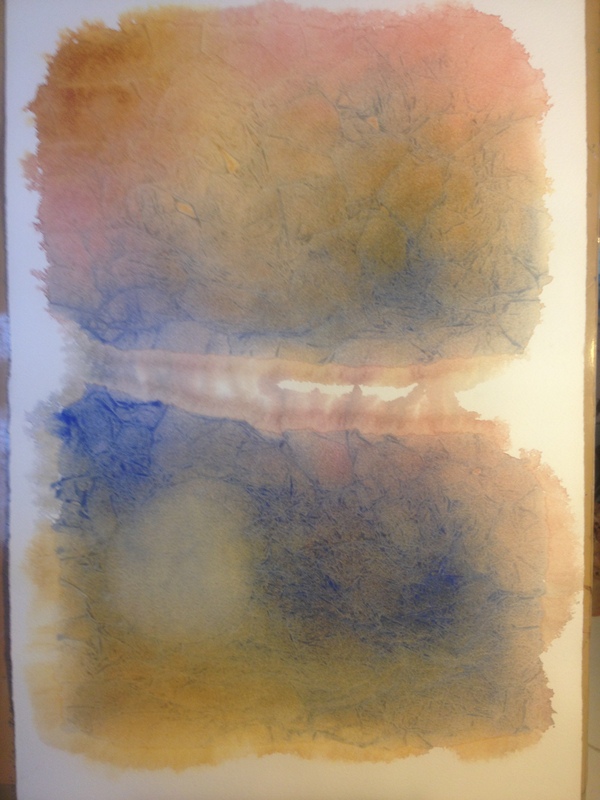 Instead of wiping up the sometimes large mixed color puddles with a tissue and throwing it out, I can dye a few papers, and often times these interesting color blends really make a difference when used later in collages or other projects. Looking at the papers now strewn across the work table, landscapes come to mind. Cool landscapes with a water feature, a good destination during these overly warm summer days. First I need to gather up the papers I will be using, maybe a glass of iced water, and then we can get started. When setting out on a journey, first things first, which direction to go in? Because I usually have more than one project started, which direction becomes a daily question. 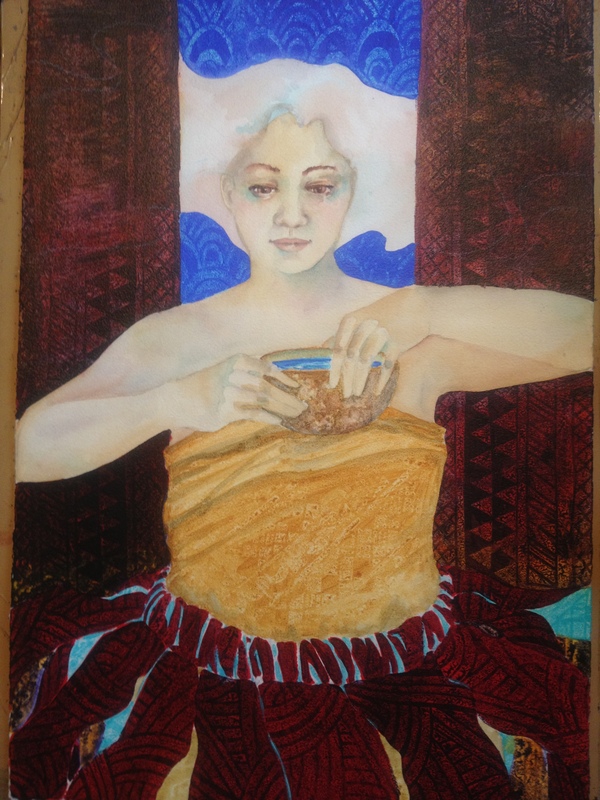 The things I do, painting, writing, sewing, and gardening, are solitary pursuits, and unless I have company, am involved in a collaborative work, or facing a deadline, the choice of direction can sometimes be hard to make. To save time I like to plan the next day’s schedule before I go to bed, figure out the priorities, so that when I get started, I can run on automatic, at least for a short time, while waiting for my brain to wake up and catch up. That is the theory anyway. But sometimes there is just too much going on in my head to settle down and follow the previous night’s plan, too many “must” things demanding attention, too many “fun” things wanting to be done. So how do I decide? This is where my sketchbook comes in handy. As far back as I can remember, growing up, pencil and paper were my ‘go to’ items, they helped me remember good times, offered escape in bad times, and afforded me a place in my mind that was quiet enough to let me focus and sort out whatever needed to be mulled over. Through the years, doodles, sketches, and creative marks, all helped to funnel the mental mayhem into something more manageable. But eventually my sketchbook went from every day use to only when ‘needed’, such as working out a problem composition, or as an emergency stand-in for a missing journal. Recently, I have gone back to my old friend the sketchbook on a daily basis, the first thing in the morning and sometimes the last thing at night. It is not easy to rebuild an old habit, but it is very beneficial. To help the process, and keep it simple, I set aside time every morning and choose a subject matter per month. 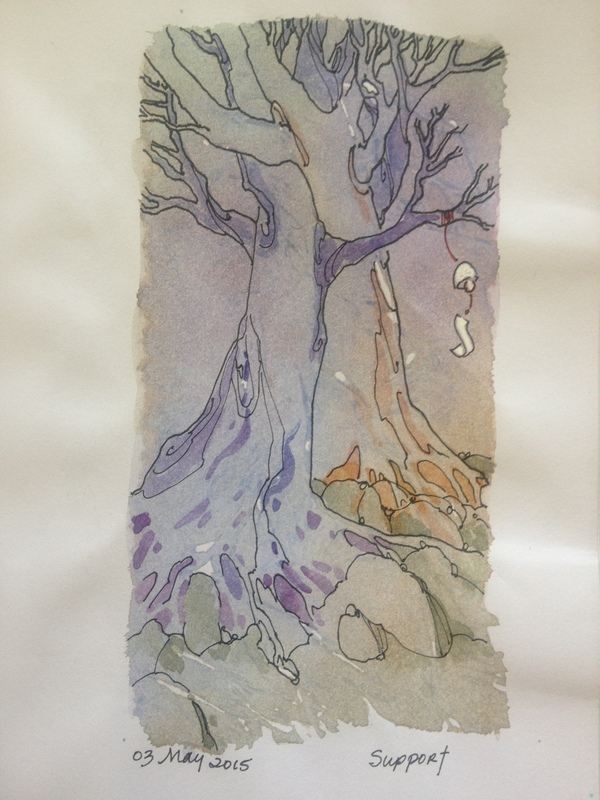 Nothing too complex but something of interest, for example, last month my subject was trees. So every morning, while waiting for my tea or coffee to brew or with cup already in hand, I drew trees in pen and ink, uncomplicated, 30 minutes, and usually with enough time left on the clock to add some color if desired. After time is up I usually find that the exercise has helped to quiet the morning mayhem, to put my mind into a sort of meditative state making it easier to sort things out and settle on a direction for the day whether previously planned or not. 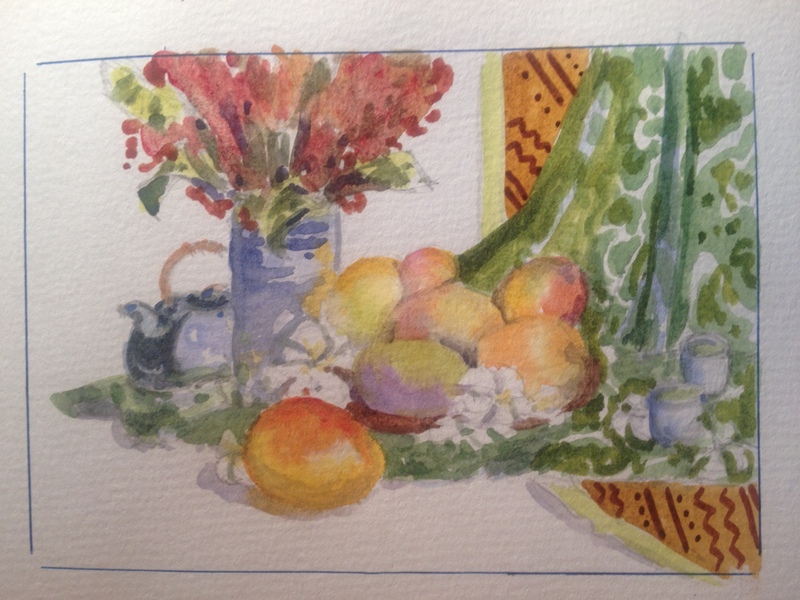 Because the sketching is only for me, concern over presentation becomes a non-issue, and there is enough flexibility built in so that when life sometimes throws a monkey wrench, there is no stress if I miss a morning or two. Later when I make the time to ‘catch-up’ on any missing days, which is purely optional, my inner voice of accountability feels satisfied and whatever stresses I have collected from the day are dissolved in my 30 minutes, (up to an hour), of sketchbook meditation. More importantly though, the built in forgiveness allows this exercise to remain enjoyable and it does not take on the mantle of chore. A month’s worth of simple sketches in addition to those done outside the morning exercise adds up to a nice feeling of personal satisfaction and accomplishment. An additional benefit to the morning sketching, I have noticed, is the emergence of themes, without conscious effort or design. By month’s end of just drawing trees, I had found inspiration for a new series of paintings which I am eager to get started on. Just more places I can explore on my creative travels.